Cheryl Gatti was the first president of the New Jersey Chapter of AALNC. Now 20 years later she again the president of the New Jersey Chapter! In this podcast Cheryl shares hard lessons learned as an experienced LNC. Cheryl and Pat have also been at times on opposing sides of cases when they were both testifying as medical surgical liability experts for nursing practice. Cheryl and her partner Jude Lark established Lark & Gatti Medical Legal Consultants. Why hospitals are putting up barriers for individuals who want to start their own businesses and still be clinically active at the same time. 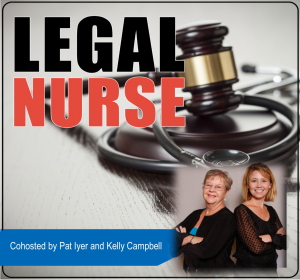 These are just some tips about how to handle your legal nurse consulting business. I have a lot more in my new 2017 book, ​How to Manage Your Legal Nurse Consulting Business: Top Tips for Success. You’ve gotten your legal nurse consulting business started, you’ve gotten clients, and you want to sustain your success. Business development and client management are intertwined. Both are necessary for a stable business. In this book I tackle how to control your money and your goals, to subdue the evil twins of perfectionism and procrastination, and to get more done through outsourcing. You can reach a stressed out state as a business owner. I share tips for managing your stress and health. The second part of the book shares tools and techniques for ​deepening your relationships with your clients.​ You will discover how to win over and retain the clients you want and recognize those who are too much trouble. ​Mastering negotiation, business communication and conflict are essential.​ I show you how. This is the book to use to build a stable foundation for your business and to avoid the hard lessons learned by an experienced LNC. Get your copy hot off the press at ​http://lnc.tips/Creatingseries ​. Use Listened in the coupon code box to get a 25% discount on the book. Cheryl Gatti left clinical nursing in 2004. She’s been focusing since that time on case review and developing her business. She was one of the founding members of the New Jersey Chapter of AALNC, which started with an idea and grew to a chapter. he brings to legal nurse consulting a clinical practice that has included staff and managerial positions in medical, surgical and critical care units. She also holds an alumnus status as a critical care certified nurse from AACN in addition to having an LNCC certification from AALNC. Cheryl left clinical nursing in 2004. Since then she’s been focusing on reviewing cases and developing her business. Explore mentorship with Pat Iyer at LNCAcademy.com to get more clients, make more money and avoid expensive mistakes. Pat is a trusted advisor to LNCs. Join us for monthly online trainings at LNCCEU.com for 2 trainings each month designed to deepen your knowledge and skills.